Notes: Here is a tune I wrote, named after the Biblical Nadav and Avihu. Like their story, the tune has an eerie, haunting feeling to it. Its played out of aDADE, but it doesn't sound like it.... Please give it a try, and let me know what you think - feedback and comments are always welcome! You can hear it in my video section on my page... Enjoy! Notes: Standard tuning, 5th String Capo on 7th fret. Notes: This is a popular fiddle tune around here so I tabbed it for 3-finger banjo. There is nothing tricky here so have fun. Notes: 3 finger picked arrangement of this fun Steve Rosen tune, more melodic in places and closer to the fiddle melody. Based on a Della Mae recording. 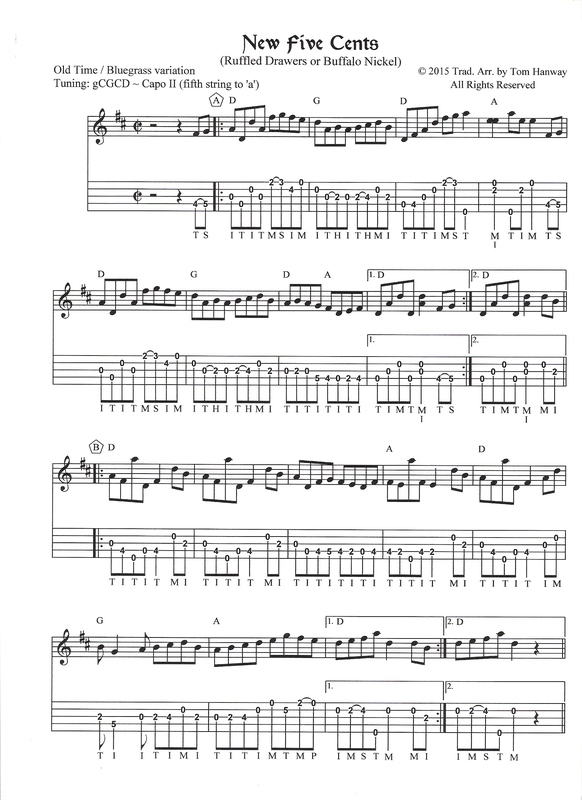 Notes: A basic clawhammer tab version for Isham Monday's Nancy Dawson in Double D tuning. Notes: Clawhammer transcription of a great Miles Davis tune. Notes: I tabbed this in the adgbd tuning. it has a little different feel to it and it has a improvised blues break up the neck. I always liked this tune but I hated having to tune on stage so I rearranged this so all I had to do was spike the fifth string to A from G tuning. Notes: If you've ever REALLY listened to Earl playing Nashville Blues on the Will The Circle Be Unbroken album, halfway through the song another banjo steps in the background and plays harmony (of sorts) to Earl's lead. This is John McEuen's 2nd banjo part to that song. NOTE: Song is in the key of Dm, banjo in Open Gm tuning, capo at 7th fret. Notes: Not the instrumental in D minor by Earl Scruggs, this jaunty little tune/song (not very bluesy IMHO, but what do I know) was written by the Delmore Brothers. The most popular recording is perhaps that by Doc Watson, who plays a couple of nifty guitar breaks. I have tried to capture the spirit of Doc’s guitar in breaks for the banjo. Nothing challenging here, just fun to play. Notes: This is my interpretation of how Ned Luberecki played this tune on his YouTube video for the Deering Banjo Co., uploaded on July 3, 2014. Adjust settings so that chords are displayed as letter names only, tab is displayed at 4 bars per line, and view is scaled to 16th notes. Notes: Composed by Tim O'Brien. An arrangement that I figured out. I don't think there are any pickup notes. I'm also not sure where the measures start and end, but the tab seems to be accurate in this arrangement. Anyway, it's a fun song to pick and sing. Notes: Bill Knopf's arrangement of Fleetwood Mac's 'Never going back again' from the album Rumours. Notes: The is Doug Dillard's break(s) which are split with the mandolin. The tune is in D, so Doug capos up seven (7) frets. Notes: The Frank Wakefield mandolin tune, "New Camptown Races", arranged for melodic style banjo key of Bb, uncapoed. It's very hard, IMO, to get it to sound really smooth but it still sounds really good. No fancy ending for this one :P With Rhythm Guitar & Bass rhythm track. The triplets are played by carefully brushing your thumb down across the strings in time with the triplet. Notes: Dec 15, 2014: Uploaded corrected file. Fixed a note error. // My transcription of Mike Munford's solo on the Frank Wakefield CD "Ownself Blues." Lots of tricky stuff. Thanks to the note isolation and i.d. feature in Transcribe software, I'm fairly certain I have the notes right. Of course, the fingerings could be different. Notes: Jean Luc Ponty's New Country. It's a great progressive style tune for the banjo. Timing is strange since Ponty will go from 4/4 time to 3/4 time over the VI an V chords and then back to 4/4. So watch out for that. It's played in the key of A, but I've tabbed it in G so you'll need to Capo 2. Notes: Here is the setting (for my mp3) using Double D tuning (Double C-Capo II) for ‘New Five Cents’, the Old Time reel that goes under interchangeable titles. The titles create confusion since there are two main branches in Old Time and further regional, local and bluegrass variants. The A Part is pretty close in most versions with one noticeable variation – either dipping down to an A-note or rising up to F# in the second and sixth measures. This variation is found in both Old Time and Bluegrass versions and a G chord is sometimes played in these spots. It’s in the B Part (fifth and sixth measures) where the melodic contour branches in one of two directions – either dipping down from the fifth (A) to the tonic (D)/D chord, or, as Paul Warren played it (New Five Cents), using a G-note double-stop with a B-note)/G chord, then up to an A-note/A chord and moving upwards happily in major second intervals. Many (but not all) Old Time versions (‘New Five Cents’, ‘Ruffled Drawers’ or ‘Buffalo Nickel’) tend to keep dipping down to the low D-note/D chord and use fewer chords than Bluegrass versions which are based on Paul Warren’s version. Notes: I've had numerous requests for a tab of my arrangement of New Railroad. I've been hesitant to do it, because of my lack of ability at transcription. So what you'll find in this tab is an arrangement similar to what's in the video, but probably not exact. Also, I don't tab all the open strings that just happen when I play, so you'll have to flesh that out. Have fun! Notes: The first and second part is mainly based on Wade Ward. The third part is an own "idea" where the melody is played an octave higher and I use Galax lick a lot. Notes: TOTW (clawhammer) for Dec 30, 2016. Banjo tuned aEAC#E. Notes: Here's a good backup line to the song, based on the Scruggs version but added my own twists here and there. Notes: English folk dance tune published in John Playford's English Dance Master 1651. Recorded with lyrics as Come You Not From Newcastle? by Shirley Collins in 1958. Notes: Irish Polkas can be somewhat boring musically, although you can play them quite vigorously and audiences usually tends to like them. This is one I decided to tab from a slow session that I play in. I believe I found a new purpose for this polka when it comes to banjo playing. This polka could be renamed "A Study in Alternate String Pull-Offs". Working on technique can be quite boring, but when you have a little tune behind it it becomes fun again. Almost every measure of this piece can be played with one or two alternate string pull-offs. If you have your hand is in first position, then you will practice the alternate string pull-off with your index finger. If you shift to the second position, then the alternate string pull offs are now down with the middle finger. So, play this tune to get a work-out and practice your alternate string pull-off technique! Have fun! Notes: This is probably my favorite banjo instrumental. written by Richard Underwood, the original banjo player for The Johnson Mountain Boys. I think the beauty is in the straight forward simplicity of the tune. Notes: As played by John Mark Batchelor. Notes: Composed by Randal Bays. Notes: My tab comprises two breaks, the first close to Earl Scruggs's and the second more improvisational. Scruggs's break is one of the most straightforward and elegant of his early recordings with the Foggy Mountain Boys, and I love it. If you take a listen to the Foggies' recording, note that they tuned their instruments up a half step. Hence they sound like they are playing in G#, although they are playing out of G position. Notes: This is my first transcription ever so there will be a lot of mistakes. I did this as an exercise because people on the BHO keep telling us beginners that transcribing recordings teaches a lot (haven't noted much of a change yet... ;). I chose "No Title Yet Blues" because I like it a lot and there are few tabs of it to be found. This is the 1st break from the Alan Munde recording, unfortunately I haven't got the original Weissberg/Brickman recording (I'd love to get that and the the other recording from the "New Dimensions" that aren't on the "Deliverance" soundtrack, if anyone knows where to find them...). The tuning turned out to be a D tuning with the 4th string dropped by a minor third to a B note. I wish I could play this tune well. Before this I had never played anything in D tuning (just got my banjo 8 months ago) so this will take me some time to play reasonably well... The tab was written using a free linux tab editor called songwrite2. Unfortunately it is still a very simple program which is why I couldn't add most of the embellishments. Notes: Note that the actual banjo tab is on Track #6 (not #1). Tune 4th string down 3 half steps to B. This version has my own 'alternate' sound at the end. Notes: My version of Nola. There are others but this is the only one in Tabledit so far. Notes: NCB is a really nice tune by Sammy Shelor, punchy banjoist extraordinaire. It starts out like Cumberland Gap but then goes off into uncharted territory. It is not to be confused with the tune of the same name by Fiddlin’ Arthur Smith and performed by Flatt and Scruggs on one of the DVDs of their Martha White tv show. The anatomy of the tune is AABB, and you should capo up 2 to play in the key of A. Notes: You can learn a lot from the variations various banjo pickers come up with to depart from conventional arrangements of tunes. Here are 2 variations of Sammy Shelor’s tune North Carolina Breakdown. The first variation is the way I hear the improvisations he plays on his recording of the tune. The second variation is mine. Notes: Another nice Scruggs/Bluegrass style tune by Bela Fleck. This was from one of the "Tasty Licks" albums (the 2nd one I think). Bela is so well known for the jazz and newgrass stuff that I think a lot of us forget that the man can lay down some really sweet bluegrass banjo as well. Notes: On a cold clear Saskatoon night in November 1997, as I came out of a Bob Dylan concert I was stunned by a virtuoso performance by the Northern Lights, shimmering, crackling, and popping in the sky. I resumed working on some ideas I had been fooling with on the banjo and tried to capture the feel of the Lights, ending up with the tune I have tabbed out here. The ascending run of triplets was an attempt to convey the sense of the shimmering and rippling of the Lights. Note that the timing gets a little bit funky toward the end of the A part, but it works. A few years ago, with my band Knee Deep, I debuted the tune at, fittingly enough, the Northern Lights Bluegrass and Old-Time Music Festival here in Saskatchewan. Notes: This Beatles classic is perfomed in the key of D with the banjo tuned (5th to 1st string): a-D-A-A-D. This unique tuning gives the banjo a very heavy drone-string/dulcimer-like feeling. Notes: This is an old Swedish "polska" that use to be sang and danced (around the Christmas tree) during Christmas.